Machining of the brake hanger brackets continues with a trial fitting into the main frame plates carried out, see photo. Sadly 82045 is not looking her best at present - the front buffer beam and all the various stretchers in the front section of the chassis are temporarily removed. The smokebox saddle has been removed, side faces cleaned and the structure refitted again during a morning's work. It is now securely bolted back in place, all rivet holes on the driver's side have been reamed and countersunk to final size and the fireman's side is now receiving attention. The rivets through the main frame plates into the saddle and the various stretchers are cold rivets which in effect means they are similar to a fitted bolt except that the protruding end is riveted instead of having a nut screwed on. We therefore have to machine these rivets from round bar stock to suit the holes and work on this job will commence shortly. Rivets in other areas such as between various stretchers front to rear or vice versa are hot rivets. 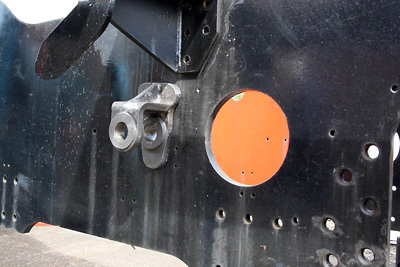 We have ordered the forged blanks for the two connecting rods. This has taken place at the present time because a member indicated that he wished to pay for a component on the loco with which he could be identified and we were aware that a forging company had some of the correct material EN16 in stock. This grade of steel is not a readily available off the shelf item and therefore we took the decision to place an order now rather than risk possible difficulties of non availability in the future. Our member concerned is sponsoring the cost of one connecting rod. If anyone wishes to sponsor the other rod, which we are covering at the present time, please get in touch with Chris to discuss the matter further. The machining of the two rods will be carried out at a later date. The autumn gala is fast approaching and as usual we will be running our very popular tombola. We will be very grateful for gifts which we can offer as prizes - the more we have the more attractive the tombola will be. Please contact Barbara or drop any gifts at Bridgnorth on Mondays please. Thank you! We will also be offering for sale some really nice model railway items, both at Bridgnorth and at Kidderminster. We are very grateful to our supporters who donate these very popular goods and are always on the look out for more. It is a splendid way to help 82045 and clear out your attic at the same time! A new leaflet is in the process of being finalised, and will be available for the SVR's Autumn Gala (21st-23rd September), Members' and Shareholders' Weekend (13th and 14th October) and future events on the SVR. The text differs from that on previous leaflets in that it stresses the nation-wide growing crisis of steam locomotive availability and suggests that 82045, as a possible prototype for series production, could provide an answer for heritage lines. It emphasises that the Trust do not see new-build locomotives as supplanting existing engines, but rather supplementing them and thereby helping prolong their lives. We hope that this will hit the right note and encourage new members to give us their support. Chris also plans to use this as the basis for a full-page appeal ad to accompany an article by our colleague Paul Anderson about his experiences of working on the 82000 class tanks in his days as a fireman at Nine Elms. Look out for this article in one of the hobby magazines later this autumn. Tony has written about the generous offer of one of our members (he wishes to remain anonymous) to sponsor the purchase of a connecting rod for 82045, which has resulted in our being able to order the steel forgings for both rods, the second being paid for out of our existing resources. The cost of one rod is approximately £5,500, and we would be most grateful if a sponsor for the other could be found. We have not really pursued the idea of sponsorship hitherto, but will be exploring this over the next few months and will start to publish a list of suitable components of varying costs. Have a word with Chris if you are interested. The first of the machined brake hanger brackets trial fitted to the main frames.